A Skeptic's Guide to the Greenhouse Effect: Can Newton's third law say anything important about the atmosphere? Can Newton's third law say anything important about the atmosphere? Here I will expand a little bit on the previous post "Why is something possible in Climate Science that is impossible in Nature?". I thought the most convenient form would be an interview with myself. A: First question: How is it possible for a spacecraft to leave the earth? A: It is because of Newton's third law. By spitting out mass and radiation in the downward direction the spacecraft must take the recoil, that is, a force of equal magnitude but with opposite direction. When this force overcomes the gravitational force Mg, where M is the mass of the spacecraft and g the gravitational acceleration the spacecraft leaves the earth. If the recoil is less than Mg after it has left the earth it will fall back again. If you have equality, it will hoover in the air. A: So you mean that radiation is a force? A: Not exactly but almost, radiation carries both momentum and energy. A reformulation of Newton's third law is the law of conservation of momentum. Energy relates to force by the formula E = Fd where d is displacement. Laser is often used nowadays to move small objects. A: And when light is absorbed it is converted into heat? A: Not necessarily, you could say that when it is absorbed it acts as a force, doing work on the absorbing material, and this work can then be dissipated into heat. But dissipation requires an environment. A: Are you implying that this has importance to climate science. A: For example, Erren and Dietze say the following: "..the Greenhouse effect (GE) is a radiative effect, i.e. warming from back-radiation to ground, which is independent of atmospheric mass.. and thus cannot be governed in its magnitude". That is clearly wrong, just look at the spacecraft. The atmosphere would fly away if the radiation exceeded a certain value. A: Aren't you beeing somewhat ridiculous right now? A: A little bit maybe, but we havn't come to my main point yet. 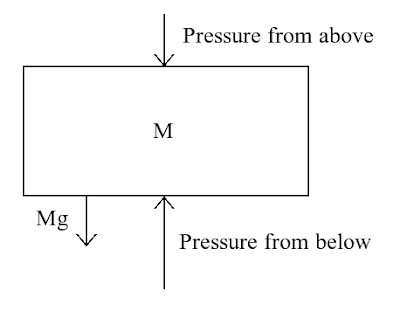 A: Have a look at the image below, it depicts an air parcel in hydrostatic equilibrium. My point is that for a hoovering air parcel the amount of backspitting of momentum is precisely governed by its mass times gravity, just like the hoovering spacecraft. This momentum can be transferred either by direct molecular collisions or by backradiation, but they must add up to Mg for the parcel to be in mechanical equilibrium. A: And your point is that the precise nature of this backspitting of momentum is unimportant for the heating impact of an atmosphere? A: Have you talked with anyone else about this? A: I don't know, but it seems as if most people prefer to use more advanced laws, such as conservation of energy, molecular spectra, HITRAN and so on. They probably think that Newton's third law is soo 17th century. A: Ok, thanks for the interview. A Note: Newton's third law of course also applies to an oscillating force in the horizontal direction.